The Grand Hyatt Cannes Hotel Martinez on the exclusive Croisette in Cannes in the South of France may be under new ownership and management, but the luxurious hotel on the French Riviera is just as extraordinary as it has been throughout its illustrious long history—and it will soon be even better. Pursuitist recently visited the five star property that has been a destination for the elite from all over the world—from artistocrats to film stars—and learned that the property, which in 2013 was purchased by Constellation Hotels Holding Ltd. from Starwood Capital, will soon undergo a complete renovation. Indeed, by the end of the year, the Art Deco-style hotel that overlooks the Mediterranean Sea will launch a renovation that is expected to take three years, although the property will likely remain open throughout most of, if not the entire, process. The hotel was last renovated ten years ago. After Constellation purchased the 40,000 square meter property, it contracted Hyatt Hotels Corp. to oversee its management. Returning guests will be pleased to know that the wonderful longtime staff at the Hotel Martinez are still to be found at the hotel, despite the changeover of ownership and management. That is indeed a good thing, as the incredibly friendly, welcoming and professional staff is arguably the hotel’s greatest asset besides its physical real estate and location. The legendary Art Deco hotel offers 409 rooms and suites, a breathtakingly beautiful swimming pool, a private beach, the L.Raphael Beauty Spa and the famous La Palme d’Or, which is the only two-star Michelin restaurant in Cannes. During our visit during the latter part of March, the weather in Cannes was beautiful, with blue, sunny skies. It was warm enough to enjoy the hotel’s pool, which is always heated to 30 degrees Celsius and is open throughout the year. The pool area is spectacular and is surrounded by hundred-year-old palm trees and potted flowers. One of the highlights of our stay was taking the hotel’s bicycles out for a spin on the promenade along the beach. Bicycles and helmets are available to guests on a complimentary basis, which is a wonderful amenity. The hotel is situated on the Croisette facing the Mediterranean in the best part of Cannes and the most famous of restaurants and shops are within a short walking distance. The Hotel Martinez’ eight-member concierge team is outstanding with each one being a member of the prestigious Les Clefs d’Or, the professional association of hotel concierges. They provided us with wonderful restaurant suggestions as well as directions for our bicycle tour of the area. The hotel’s 409 rooms, which includes 27 suites, are beautifully appointed. Many rooms have spectacular panoramic views of the Mediterranean and all are outfitted with beautiful marble bathrooms. Junior Suites on the seventh floor of the hotel (the top floor) are 100 square meters or larger and equipped with expansive sun decks featuring teak steamer chairs and chaise lounges and dining sets. The stunning 1,000 square meter Penthouse Suite is one of the largest in all of Europe. Executive Chef Christian Sinicropi oversees the hotel’s famous 2 Star Michelin restaurant, La Palme d’Or. His culinary stills are innovative and his artistic talents are impressive as he and his wife together produce the ceramic plates in which his culinary creations are served. The restaurant Le Relais, which serves bistro-style cuisine, is located alongside the swimming pool. The Bar L’Amiral, which also overlooks the pool area, is famous in Cannes for its warm hospitality and piano-bar atmosphere. The hotel’s private beach club, “Zplage Beach Club & Restaurant“, is only open during the summer season. On the top floor of the hotel, there is a full-service 900 square meter spa that offers a wide choice of facials and massages. There is also a 24-hour fitness facility with state-of-the-art equipment outfitted with television sets and iPod docking stations. Saunas and showers are located in the dressing rooms in the fitness area. 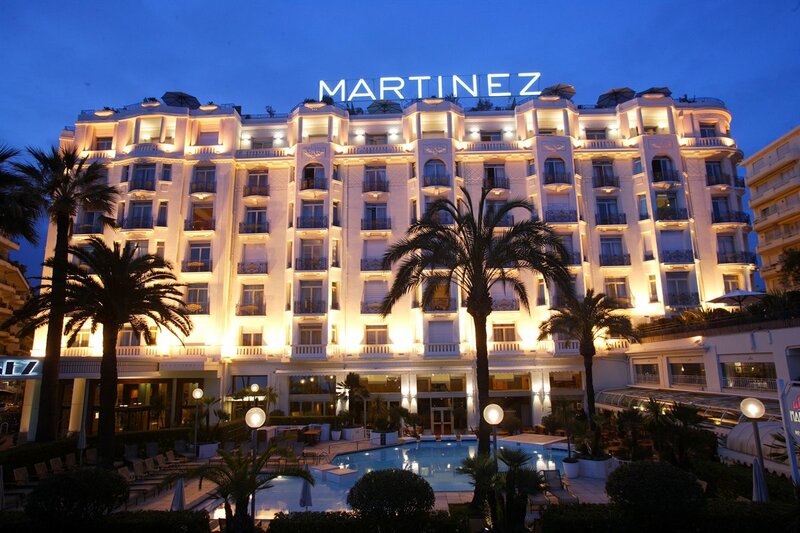 Each May, the hotel is at the center of Cannes’ annual international film festival (Festival de Cannes), as the Martinez is a favorite haunt for film stars, directors, producers and the like. While the hotel is busiest during the festival as well as during the months of July and August, it is an exceptional place to visit during the quieter periods, as Pursuitist experienced. The hotel is family-friendly and children under the age of 12 free when sharing a room with their parents. There are also special children’s menus at the Zplage restaurant, the Restaurant Le Relais as well as Room Service. The hotel’s Kids’ Club (ages 4 to 12) is open during July and August as well as during the Easter holiday. The hotel is also dog-friendly as well, although pets can not be left in guest rooms unaccompanied (dog sitting is available). The hotel’s high-speed Wi-Fi access is complimentary and is available throughout the hotel, including the pool area and the hotel’s many conference and meeting rooms. Reservations for the Grand Hyatt Cannes Hotel Martinez may be made by calling +33 (4) 93 90 1234 or visiting the hotel’s website.